A 15-year-old female athelete active in running competitions comes to your clinic complaining of knee pain over the medial knee joint. This pain is exacerbated by knee flexion and she notes popping and snapping when she stands from sitting. Your exam shows tenderness about 1 cm medial to the patella with palpable fullness in the area. 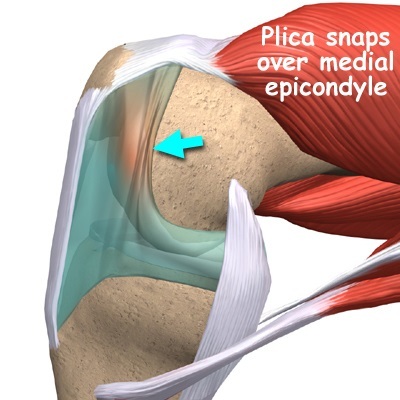 Plica syndrome (also known as synovial plica syndrome) is a condition which occurs when a plica (an extension of the protective synovial capsule of the knee) becomes irritated, enlarged, or inflamed. The presentation given in the case scenario is typical for plica syndrome. The plica is a synovial remnant that did not resorb properly during development. It can be irritated, usually chronically or sub acutely, especially in sports that require repeated flexion of the knee (rowing, cycling, running). The inflammation is typically caused by the plica being caught on the femur, or pinched between the femur and the patella. The most common location of plica tissue is along the medial (inside) side of the knee. Treatment includes rest, ice, quadriceps strengthening, and NSAIDs. If conservative management fails, steroid injection or arthroscopy may alleviate the symptoms.